* 4 players is the maximum for our edition, other editions go up to 8. There is no reason not to play with more. If you love cursing the lottery queen, please find yourself a seat, we have a game here that should be exactly up your alley. In case you also fancy patience or other solitaire games as a pastime, you can make yourself comfortable, cancel all appointments for the rest of the day. Better yet – call in sick for the next few days. Take it easy has the potential to appeal almost instantly thanks to one big strength: straightforward rules. Looking at the pieces it not only takes you less than one minute to listen to all relevant rules – you can also grasp them in the same amount of time. 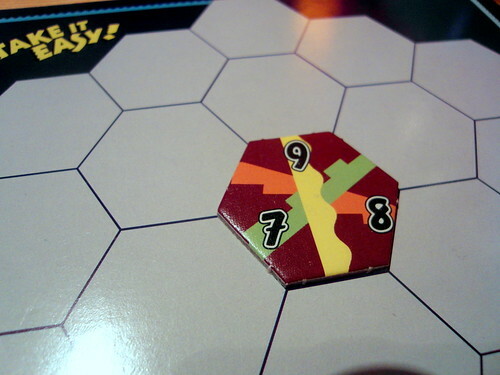 Each player gets a hex-shaped board consisting of 19 spaces for hex tiles, plus an identical set of 27 tiles which happen to fit nicely in the gaps on your board. Each tile has three threads (aka straight lines), each connecting two opposite sides, thus creating a crossing in the middle of the tile. in three directions – north-south and each of the diagonals. There are nine different threads in total, each thread having a distinct color and (more importantly) distinct value between 1 and 9. For each direction you only have three possible threads (e.g. 1, 5 and 9 for the north-south thread, 3-4-8 and 2-6-7 for the diagonals). You will be wiser about why this is important in a few moments – for now just note that tiles have a fixed orientation. There are 27 tiles and 27 possible thread combinations. If you figured that this congruence means something you have deserved yourself a pat on the back. One player (we will call him MC, but is more aptly called the punching bag) flips their tiles to their reverse and shuffles them. The others are encouraged to roughly sort their set of tiles to speed up the game, but that is optional. The MC turns over one of their tiles and reads/reveals it to the others. All players take the same tile and place it at one spot of their hex. Once all players have done so, the MC chooses the next random tile, which is placed in any free spot on the players’ boards. Once a new tile is drawn, no changes to the tiles already placed are allowed – so choose carefully. You will note that tiles which touch on any of the six sides will continue the threads depicted on them. It may not come as a surprise that matching threads is utterly beneficial. Only 19 of 27 tiles are placed, so you cannot bank on certain combinations to come up in the game – a fact which not only can, but WILL make you sweat, hope and swear many more times than is strictly good for your heart. On the topic of scoring – you might find yourself using a calculator based on limited motivation to apply mental arithmetic, but the scoring principle is really very simple. You only score points on uninterrupted lines of the same value which reaches from one end of the board to the other, meaning lines range from three to five tiles in length. Simply multiply the number of tiles by the line’s value, so e.g. a 4-tile row of 8s gains you 32 points, The maximum line value is therefore 45, the lowest is obviously 3. After calulation, the boards are emptied and it is the next player’s turn to play lotto queen, until it has been all players’ turn once (actually the amount of games is pretty much left to your own devices, just quoting the rulebook here). Considering all players get the same tiles in the same order and with the same goal, it is understandable the the initial reaction of many among you will be to assume that identical patterns among several players will (and therefore ties) will be the rule rather than the exception. Strange as it may seem, it is quite the opposite. Identical scores and boards are so rare that I can recall only exactly one in several hundred games. Unless you peek to the other players’ boards for inspiration (and even then) you will have different ideas about one of the first two or three tiles… and once there is as little as one difference, usually parallelism will be out the window due to the resulting lanes that form once one element has been defined. 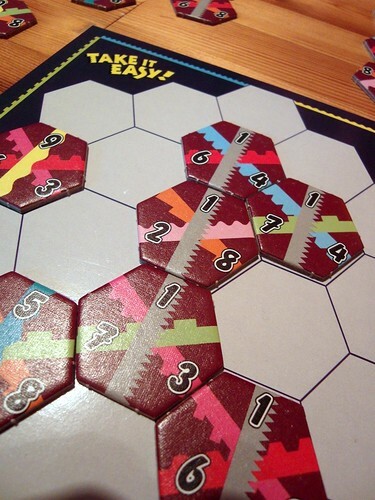 So do not fear – Take it easy is much more than merely a multi-player puzzle! It is not too often that you get abstract games which appeal to ‘non-gamers’ – but Take it easy has the potential to win over novices based on (a) its easy and straightforward set of rules, (b) the brevity of a round and the flexibility in terms of game duration and, to some most importantly, (c) thanks to its pacifist nature. There is no in-game interaction, which is a factor that is especially appealing to players who have just finished a game of Settlers in which they were cornered from the second round… or any other game in which veterans can take advantage of newbies by superior strategy. Of course, looking at it from a different angle this lack of interaction is also the game’s biggest – maybe: lone – drawback. Experienced strategy foxes will miss the chance of outmaneuvering opponents, and of course there is the fact that once you have hit the magic 307 (which is the high score), there is little left to tickle ones ambition. While the chance factor is far too limited to make the game complex or unpredictable, it does make the game entertaining and (to a degree) different each time you play. Combined with a steep learning curve and no direct competition affecting (a voice in my ear suggests: ruining) your game, Take it easy is a great way to involve new players . And if that is not enough, you can still bash the player who is drawing the tiles… I mean, really, did ANYBODY EVER EVER NEED THAT 5-6-4 you just drew!?! Meh!